‘Thicker Than Soup’ is published by Troubador on 28th June 2015 and is available from the publisher and all good bookshops. 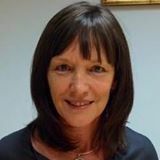 Thank you so much for agreeing to be interviewed for my blog Kathy. Thank you, too, Linda. It’s a great pleasure to be invited. ‘Thicker Than Soup’ is your debut novel. I know that you’ve got personal experiences that helped in the writing. Could you tell us a bit more about the inspiration for your story? The inspiration for Thicker Than Soup came from several directions. Firstly, I’d just finished a year of working with VSO in Pakistan and it was very fresh in my mind. And, whilst there, a couple of vaguely related books had impressed me greatly: Oswald Wynd’s The Ginger Tree and Francis Osborne’s Lila’s Feast; both stories of strong women whose lives were greatly changed by Asian cultures. On my return, a friend who had read some travel writing I and my husband had done, suggested I wrote a book – it struck a chord. But writing a book about travelling didn’t feel like the right sort of challenge. I read a lot. So, I wondered, could I write a novel? You cover huge themes in your writing. Why did you decide to explore them through fiction? I worked in HR, I’ve trained people, I read psychology at uni – I’m curious and fascinated by people. I love the justifications we make for our decisions, the vulnerabilities that make us human, the inexplicability of emotion. And I love peeling back the layers. One of the strange things that happen through writing is one uncovers old truths, and one I recently recalled was the excitement of my late and lovely father uttering “Once upon a time, in a far off land, there lived a…” Is it surprising I love travel and fiction! If ‘Thicker Than Soup’ could be made into a film, who would you cast as Sally and John? It’s certainly a visual story, and emotional too. Hmm, how about the beautiful Aishiwarya Rai, or perhaps Kate Beckinsale as Sally, and chunky loveable James Cordon as John – if he can play a hard man too. Will the short stories that you’re currently writing have similar themes to ‘Thicker Than Soup’? The ones I’ve written so far certainly explore relationships and the human condition, some of them are set abroad, and food seems to crop up in a variety of guises. But this is where my writing comes from and there aren’t any deliberate links. I like writing dialogue. It ‘says’ so much and can be used to disclose or mislead or disguise. And, as you might have already gathered, characters are at the core of my writing. But I also like to settle into a space and absorb it. It might be a local café or (one of my favourites) a Norfolk beach in the winter. I once tried my hand at watercolours, and rightly gave up very quickly. But the effort wasn’t wasted – describing a setting needs the same deep analysis, and at least with writing I can shape and re-shape for as long as I need to. And that’s where my frustrations lie. I’d love to be a poet. But I’m not. And finding the right words and putting in the right order so that the hairs stand on the back of the neck is something I spend far too much time trying to do. It took me around three years to write Thicker Than Soup, and another three years turning it into a jig-saw and putting it back together before it was published. It’s a better book for it, but over that time, the story hardly changed! I write in my spare time, which in reality means, I write instead of doing the housework! 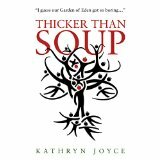 When I started Thicker Than Soup I had no intention of publishing it. I write because I love writing. I write where I’m comfortable; in my study – a lovely garden room with lots of light, or in the winter, I write with my feet up on the sofa in front of a log fire. Or anywhere I can get into that place in my head where ideas and connections happen, which is a great place to be. Of course, it’s not always like that, but time flies when it is. I read every day – I have to have my fix! My favourite genre is literary fiction, and I like easy poetry too. I’m currently reading Mr Mac and Me by Esther Freud. It’s a compelling story told by a poor Suffolk boy who befriends Rennie Macintosh during the WW1. And I’ve just read The Guest Cat by Takashi Hiraidi – a must for cat lovers. The last poetry I read was Carol Ann Duffy’s The World’s Wives, which is another must, this time for all women. Do you have other interests that give you ideas for writing – I’m assuming travel and cooking might be some of them? You’ve hit the nail on the head. Cooking and travelling, yes. And of course, reading. Then there’s walking, opera, the theatre…. I’m compulsive. As for ideas– they’re everywhere. I just pick them up and re-shape them a bit. What advice would you give to someone thinking of changing career and becoming a writer?